Some rumors just sound too good to be true, but with the modest update to the Xperia Z flagship Sony's hottest phone may land in a forgotten mid-range series. The Sony Xperia P2 borrows the transparent strip of its 2012 predecessors and spices up the looks with super-thin bezels. Leaked diagrams and specs point to a 5.2" Triluminos IPS screen with 1080p resolution, basically the same screen as the Xperia Z4. 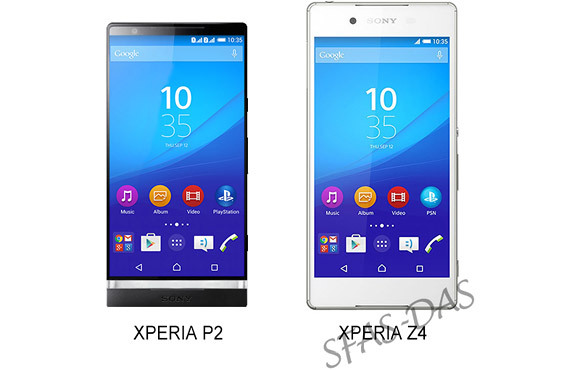 Side by side, however, the P2 looks tiny – 137.3 x 67.2 x 10.9mm. Compare that to LG G2's 138.5x 70.9 x 8.9mm. The screen glass will be beveled at the edges at a thickness of 0.8mm. Okay, the Sony Xperia P2 sounds a bit thick, but the back is curved ranging from 8.9mm to 10.9mm. The payoff is the huge 4,240mAh battery inside, that's more than most phablets and the Moto Maxx/Turbo. Sony will allegedly revamp the camera department that hasn’t seen a major upgrade since the Xperia Z1. The new camera will have an Exmor RS sensor of the same size (1/2.3") but at lower resolution (12MP) meaning bigger pixels. It will feature a Sony G OSS lens, which essentially means optical image stabilization. It will be a wide-angle 25mm lens with f/2.0 aperture and there is a dual-LED flash below it in the diagram. The camera will will record 2160p video. For still images ISO will range from 64 to 25,600 and 12-bit RAW. The selfie camera is slated to be a 5.1MP/1080p shooter. According to the leak the Sony Xperia P2 will be powered by a Snapdragon 810 chipset that may be slightly downclocked – the four big A57 cores are listed at 1.9GHz instead of the usual 2GHz. This may be to reign in the heat. The phone will have 3GB of RAM and 32GB storage. The status of an expansion slot is unclear. There are no stereo speakers in sight either, but the transparent strip below the screen will probably be illuminated like on the original Xperia P, which was an attractive design element. The Xperia P also had a metal back too, unfortunately there's no image of the back of the P2. 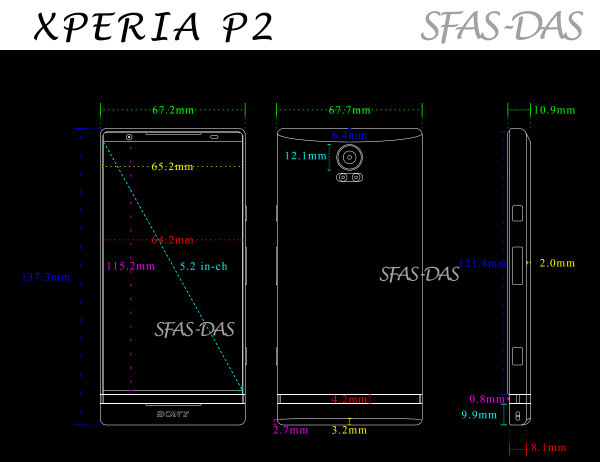 The Xperia P2 sounds like a dream phone so far with a few catches – the biggest of which is that it might all be a fan-made concept.